First, the establishment media (NBC, ABC, the New York Times, and the Washington Post), long ago discredited for their biased reporting and left leaning agenda, have already written off Donald Trump’s chances for victory. A media who usually loves the ratings surge that comes from a competitive race is literally telling people that the presidential contest is over and Hillary Clinton’s victory is all but assured. Then we have the establishment Republican party. The reluctance to endorse their own nominee was unprecedented. That political slow dance, however, was nothing compared to the rapidity by which those same tired R.I.NO.s abandoned Trump following the conveniently timed release of an 11 year old tape. The desired result of so many senators and congressmen withdrawing an endorsement? The establishment media could further sound the death knell for the Trump campaign. Lastly then we have the establishment pollsters. 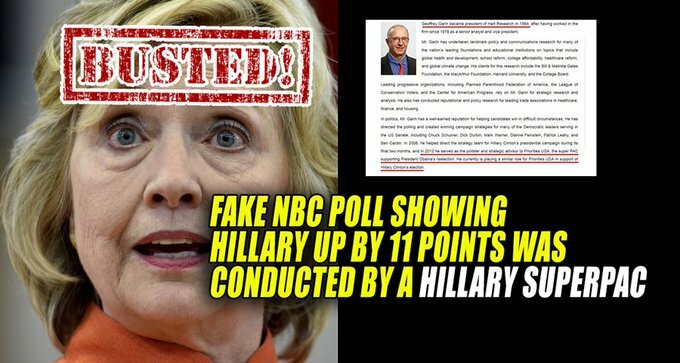 They have been producing polls all summer long which surprisingly have shown Hillary Clinton leading. Surprising because the “front-runner” is a candidate who is rarely seen actually campaigning, who can’t fill even the smallest of venues, and who is despised by nearly as many progressives as she is conservatives. This election is currently a battle for the hearts and minds of the American electorate. This campaign is now 100% about enthusiasm and turnout. Trump has ALL the enthusiasm, so the only path to a Democrat victory is to create despair. Suppress turnout for Trump by throwing a wet blanket on the prospect of victory. And currently they are doing a pretty good job of this. “(A)sks more than 400 people each day about their voting intentions. The poll is part of the Understanding America Study (UAS) at the University of Southern California’s Dornsife Center for Economic and Social Research. “Each day’s poll respondents are a subset of the UAS election panel, roughly 3000 U.S. citizens who were randomly recruited from among all households in the United States. Respondents are asked three predictive questions: What is the percent chance that (1) you will vote in the presidential election? (2) you will vote for Clinton, Trump, or someone else? and (3) Clinton, Trump or someone else will win? “Results are weighted to match demographic characteristics, such as race and gender, from the U.S. Census Current Population Survey, and are aligned to the 2012 presidential election outcome using self-reported votes in that election. “…the team of researchers at USC who conduct the poll used the same technique four years ago to forecast the 2012 election. In other words, this is THE poll to follow and to SHARE with others. So, what does it show? The USC Dornsife/L.A. Times Presidential Election “Daybreak” Poll has consistently shown Trump either even with Clinton, or up. As of October 17th, he is back in the lead by a point (44.8% to 43.7%). Even more impressive is Trump’s lead in most subcategories. With voters 36-64 Trump leads 44.7% to 43.7%. Among the always dependable 65+ voters Trump leads 49.9% to 45.3%. He leads among those with a high school or less education (51.5% to 39.6%) and among those with some college (47.7% to 39.5%). Trump also leads with income earners of $35-75k (50.2% to 38.3%) and more than $75k (46.3% to 42.6%). Trump leads with white voters by over 20 points (54.0% to 33.8%) and Other voters (non-Black & non-Latino minorities) by double digits (50.4% to 39.9%). Finally, the gender breakdown may be most compelling. Among female voters Trump is only behind by single digits (Clinton 48.3% to 39.2%) but he holds a double digit lead among male voters (50.6% to 38.8%). But since the real battle at the moment is for control of the narrative as the establishment tries to create a sense of inevitable defeat for Trump, it’s the second half of the USC Dornsife/L.A. Times poll that is most telling. When respondents are asked who they THINK will win an overwhelming majority say Clinton (57.3% to 37.2%). And that sentiment holds across every demographic, regardless of gender, race, education, or economic class. Every group BELIEVES that Clinton will win, even though they themselves plan on voting for Trump. And that’s the story of these final three weeks. Trump will win only if his supporters believe he has a chance, refuse to despair, AND turnout to vote. This will only happen if those looking to defeat the establishment candidacy of Hillary Clinton capture the narrative back and promote hope instead of the false inevitability pushed by the media. One possible weakness of this poll is that it is aligning with the 2012 voter turnout. Many signs indicate that in 2016 turnout will be lower among Democrats and higher among Republicans.